As with most anthologies, I found stories I loved in “Playing With Fire” and some I didn’t care so much for. But even the ones that didn’t grab and hold me spellbound were still good stories. Though I found most of these to be well written artistically, there were a few problems with editing—commas missing, awkward wording, details that could have used the hand of a good copy editor. Most places only caused a momentary blip in my reading, but would have been so much better without. Still, even with the blips, well worth the .99 cent price for my Kindle copy.Lots of ghost stories in this anthology. If you are into ghosts and hauntings, then this is the book for you. Ghosts looking for revenge and ghosts that maybe are more than they first appear, like demons called up from hell and never sent back again. Not a place I wanted to be, other than under my covers with a flashlight on the screen. Add into this a couple of flesh-eating zombies, a DNA experiment mixing human and the stuff of nightmares, and you are Playing With Fire. No matter what type of horror you’re attracted to there will be several here that will no doubt leave you spellbound.I enjoyed this book, reading straight through in one sitting. The stories were great, nary a dull moment in any of them. Some I loved straight away, others took a little more time to get into - and a couple were just what the doctor ordered for making me shiver as I listened for bumps in the night. We all look for a little something different when it comes to horror. I want a story that will make me squirm while I read, usually with a blanket covering my toes so the boogeyman can’t reach out and grab me. My expectations were high going in and except for the odd editing issues I ran across here and there, I wasn’t let down. All in all, this is not a bad anthology. Two or three of the stories are first-rate by any horror standard. The rest will depend on what the reader is looking for in horror. Definitely had me biting my nails in a couple of places. I’m going to be on my best behavior around witches who perform black magic from now on, that’s for sure. 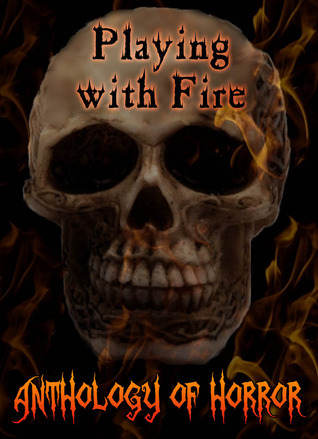 Playing with Fire, Anthology of Horror, Vol. 1, features nine short stories (three threatening to be novellas) by seven authors.Best Served by Susan Evelyn, is a small scale revenge story that convinces itself it's a tale of justice. What it isn't is a horror story. It's nicely written, but is a fantasy hiding in the wrong anthology.Things pick up with Widows of the Night, a child's revenge tale by Robynn Gabel, which is absolutely for horror fans. I liked it. Bitten by Nomar Knight is a very uneven tale that starts with a Cujo-feel, zigs to make the reader think they're following a werewolf, takes a lazy and tired detour through the 'evil government killing the planet and the people' landscape (free tip for horror writers: I don't care about your politics. Neither do 40-60 percent of your audience regardless of what they are). It ends as a funny, bloody, gory (but twist-less) Tales From the Crypt episode. It's well written and creepy for what it is, but what is it?Then comes Playing with Fire by CAV Laster. Who doesn't love... ? Well, trust me, you'll love this.The middle of the book slows down a bit with two Coral Russell stories in a row. Devil of a Ghost Tour and Key to a Haunting. 'Devil' is an often engaging tale of sin and violence in 1885 El Paso that leads to present day haunts and work for modern ghost hunters. 'Haunting' features a return of the same El Paso ghost hunters, examining condos haunted by the results of a 1920's tragedy. (Based on an actual tragedy). While well-written, both are too similar (using the same technique of jumping back and forth in time) and too long (nearly 10,000 words apiece) to keep the reader turning pages at a horror story pace.Next comes two Brian Fatah Steele stories. Flawed, an intriguing story of a house that possesses its residents in a very personal way, and The Stuff Dreams Aren't Made Of, an absolute gem of which I'll tell you nothing. Just enjoy it.Finally, Chryse Wymer's This Dark Magic, a deliciously written, hard-boiled witchcraft story (that should have started at chapter two). Chapter one tells us our protagonist is a reporter covering... absolutely nothing - until chapter two. Still, good stuff!Also included are two novel excerpts; the beginnings of Coral Russell's Amador Lockdown and Chryse Wymer's Living with Murder. I not only admit, I state, that I did not read either. I don't read excerpts - of anything. If it's a page-turner, I'm annoyed and screwed. If I read 'part of' a book, it's because I hated it and chose not to finish it. But these are extras, so I'm not griping, I'm just saying. Anthologies are, by their nature, uneven. Every reader, after all, has different tastes. There are many flavors here and all are pretty-well written. There are likely several pleasing dishes for all. Playing with Fire deserves an audience. This book is an engaging, thought-provoking collection of horror stories, giving the reader a virtual smorgasbord of frightening characters and events. From a house that consumes its inhabitants to ghosts, zombies and black magic, this book has it all. As with every collection I've read, I have my personal favorites. Two short stories in this collection I wouldn't mind reading as full-length novels, their plots and characters were so strong. Chryse Wymer's This Dark Magic and Cav Laster's Playing With Fire were fascinating tales and I would certainly read both in a lengthier version. Widows of the Night, by Robynn Gabel, was enthralling and her young protagonist was pulling at my heartstrings from the beginning. This is a story told from an abused child's point of view, and it is a harrowing tale of salvation. Best Served by Susan Evelyn spins a tale of revenge sought for the death of a friend and Bitten, by Nomar Knight may be any spurned husband's dream. Key to a Haunting and Devil of a Ghost Tour by Coral Russell are both well-written and engaging tales of hauntings, demons and skeleton-bound closets. Her ghost hunters, Hector and Marcos, are appealing personalities, even though they are secondary characters in these short stories. They also inhabit the excerpt from Amador Lockdown, which left me wanting more. Flawed and The Stuff Dreams Aren't Made Of by Brian Fatah Steele were stories of the variety that deliver twisted realities and tingling spines. Flawed explores the faults and failings in ordinary people, exacerbating them until the individuals are consumed. The Stuff Dreams Aren't Made Of delves into the things any one of us might do in exchange for brief glimpses of better times. I enjoyed reading this collection, and look forward to future efforts by these authors. This anthology reminded me how much I enjoy reading scary short stories and I was grateful to be introduced to all these talented authors. Every reader will have their favorites, but the first story that grabbed me was Widows of the Night by Robyn Gabel. I rooted for the abused little girl and was happy when she found the perfect key to escaping her abuse. I was pulled into and enjoyed the story Devil of a Ghost Tour penned by Coral Russell, but this author’s tale Key to a Haunting totally captivated me. I was particularly intrigued by an antique bracelet that appeared as a meaningful thread beautifully woven throughout the story. The author had clearly done her research and the haunting was based on an actual fire at the Triangle Shirtwaist Factory which occurred back when teen girls were locked inside buildings by business owners to sew their lives away. The accurate description and details came through and gave the haunting a nice realistic feel. The anthology ended strong with a story and novel excerpt by author Chryse Wymer. Wymer has an unforgettable vivid voice that makes for fun reading and there were some wonderful creepy moments in This Dark Magic that I’ll never be able to shake. Her excerpt of Living with Murder was full of strong characters and unpredictable twists that made me wish the anthology wouldn’t end. I will happily grab Living with Murder and any novel written by Chryse Wymer. This anthology is a fun read and I highly recommend it. This anthology of scary stories is like picking several horror movies at random from the video store - some of the stories are true masterpieces of scary, while others leave much to be desired. The few so-so stories included in this anthology are easily eclipsed by the better stories, making it a worthwhile read overall. The better stories are sure to make your skin crawl and force you to look over your shoulder in paranoia! I found this book to be one best I have read in a while, I could not put it down until I had finished it. Coral Russell's stories I thought were the best they just seemed to flow into one and another. I definitely would read more books written by her. Nine horror stories are presented in this anthology, two of them excerpts from novels to come. They range from human horror to ghost hunters, from fantasy to science gone wrong, from a house that’s haunted in a very different way to witchcraft, and one that I never figured out if it was a werewolf or a zombie story. The scary factor will vary according to what the reader’s particular psychological makeup is like; for me, none were creepy crawly but all were well written. The ghost hunter stories I feel would make a good TV series, while “This Dark Magic” has enough twists and false leads to keep things very interesting. The formatting has some rather unique problems, which are annoying but not enough to make me stop reading. A quick and fun read for horror fans. There were some great shorts in this collection of horror/supernatural thrillers. There were also some excerpts of larger novels which I was not expecting when I grabbed this Kindle title from a daily deal. I enjoyed some of the shorts. I'm not sure if any of the excerpts have convinced me to pursue finishing the books. All in all, an entertaining read to fulfill my Halloween inspired need to read some horror. Nice anthology of horror stories more in line with Lovecraft than King or Koontz style horror. Very readable if you like short stories and wasn't a bad way to spend an afternoon in the sun. Jane Doe Chryse Wymer Nomar Knight CAV Laster Brian Fatah Steele - Librarian Note: There is more than one author in the Goodreads database with this name. "Jane Doe" is a name frequently used as a pseudonym by women who wish to be anonymous.